What’s A Weighted Pocket Quilt? Note: Since I share great projects with you, this post contains affiliate links for my favorite products used. I’ll receive a small commission on any purchases you make but it will not affect your price. Thank you! 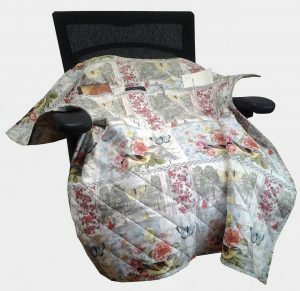 A Weighted Pocket Quilt is a customized lap quilt for prolonged sitting. They are a perfect solution for anyone with limited mobility! Weighted Pocket Quilts have pockets to hold personal items. Most importantly is my secret to keep them from slipping, falling or blowing off your lap. How many times do you grab your purse throughout the day? Now imagine sitting with only limited access to what you need. Then envision your arms propelling yourself around instead of your legs. With your hands busy, how do you hang on to your phone, keys, or purse? That’s an incredible challenge and one I was determined to overcome. Recently, when a wonderful new idea presented itself, I acted on it immediately. I noticed a wheelchair bound co-worker always had a large, heavy towel over her lap. Folded on top was a smaller towel with personal items tucked in. We talked a bit about sewing and quilting and I asked if I could make her a quilt to use instead of the towels. She appreciated the idea and we talked about functionality and most importantly, colors! As quilters, we are creatively inspired and love to share what we design. I was so excited to make my first Weighted Pocket Quilt. Finding a quilting opportunity to make a difference in someone’s life is incredibly fulfilling. There are countless baby quilts I’ve made that have adorned a newborn’s crib. I’ve gifted many lap and bed quilts to friends and family. Sharing a quilt sends a message of love from me. Designing a Weighted Pocket Quilt for a friend is another way to share my gifts with others. Why A Weighted Pocket Quilt? Think about how wonderful it feels stepping out into a cool breeze wearing your new swing coat. Feeling the light wind is invigorating as your hair stylishly blows around your face. But wait, what if you’re in a wheelchair? Do you deserve any less style and confidence? Of course not! Weighted Pocket Quilts offer a fashionable accessory to look and feel fabulous when sitting is your only option. They can be fun and whimsical, stylish and chic, and even interactive for kids. There’s not a more thoughtful gift than something that brings a smile. Even better are all the smiles from passersby who enjoy your creative expression. Consider making a Weighted Pocket Quilt for someone you love. Then make ten more to give away! Perhaps to the children’s ward at your local hospital, or an extended care facility, and keep in mind those folks in need. Local churches can help you find the perfect recipient for your new Weighted Pocket Quilt. My first step was to look for a pattern online, but nothing existed. There were all kinds of bags for walkers and wheelchair handles, but nothing to lay across your lap when seated. Consider how awkward it would be to handle a bag behind you while sitting in a chair. That’s not practical at all! So out came the notepad and pencil to jot down some ideas. The basic design had pockets across the top edge. To keep items from falling out, I added a few extra inches that would fold over the pocket openings. This was also a great opportunity for a second layer of pockets on the underside. These were less visible and very easy to reach into. A great idea was formulating. Ideally, a Weighted Pocket Quilt can be used to store items much like we would use a purse or backpack. Varying size pockets allow for a wallet, phone, comb or even a book. The basic concept is to provide an attractive lap cover that will also hold various personal items. Since it’s relatively small, just 42” x 42” inches, my concern was how to keep it from sliding around or blowing off with a gust of wind. While developing this idea, my daughter-in-law was making weighted lap pillows for special needs children. When she showed me the beads used to weigh down the pillows in their lap, I knew they would be perfect to stabilize my quilt, too. With a bit of experimenting with the weight of the beads and inserting them into the quilt, my problem was solved. Adding a couple side channels to hold the weighted beads were the last necessary components to complete the project. My new quilt came together quickly. Isn’t it amazing how the simplest ideas can be the best solution? Weighted Pocket Quilts are a wonderful way to improve access to personal items for anyone, whether in a wheelchair or sitting in a recliner. It’s a practical variation of a lap quilt for watching TV. My Weighted Pocket Quilt ecourse and pattern are available at no charge. Since weighted poly beads aren’t available in a lot of stores yet, the easiest way to find them is online. I encourage you to give it a try. Sign up for my free Weighted Pocket Quilt e-course with detailed instructions and to download your free pattern. When you sign in to view my free e-course with illustrated assembly photos, you’ll also have access to the free pattern to download. It’s a quick project. With just a few yards of fabric and a bit of time, you’ll have a completed Weighted Pocket Quilt. Please share this pattern so more mobility-challenged folks can enjoy their own Weighted Pocket Quilt. Or make them as a community service project to give to hospitals and extended care homes. I hope you enjoy making these quilts for others as much I do. If you’re not a quilter, please pass this on to someone you think may be interested. Keep in mind, these make a wonderful, stay-in-place lap quilt, too. You can have everything close by within reach, including the remote! Have fun with this project. Thank you for reading this post.